The scheme is being led by Shirley Advance, the developer responsible for the recent Parkgate development in Shirley town centre. 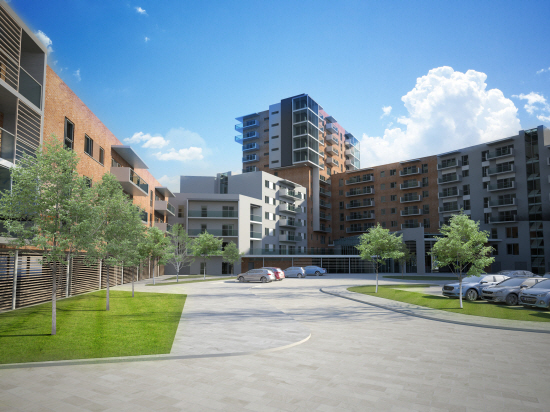 Now it has the green light, the site will be transformed with a 261-apartment ExtraCare retirement village, 113 new homes by Lioncourt Homes and a petrol filling station. The scheme will have an end value in excess of £75 million and those behind it say it will ‘bring a further boost for Shirley’. Shirley Advance teamed up with Solihull Council and ASDA to bring forward the development. The site is already owned by the three parties, so no additional land is required to deliver the project. All of the existing buildings on the ten-acre site will be demolished, including the old Powergen tower and the redundant multi-storey car park. · An ExtraCare retirement village for older people with 261 x 1 and 2 bed apartments. 60% will be offered on an ‘affordable’ basis with 104 x Shared Ownership and 52 x Rented dwellings. · A total of 113 new homes to be delivered by Lioncourt Homes with 57 x 2 bed apartments, 7 x 2 bed houses, 31 x 3 bed houses and 18 x 4 bed houses. These properties will be built to comply with the Government’s ‘Help to Buy’ initiative. · A five-pump ASDA Petrol Filling Station with Convenience Kiosk. · Associated Car Parking and Highway Works. Site clearance and demolition work will beging in the spring, together with associated on and off-site highways works. It is envisaged the first new homes will be ready by the end of 2016 and the petrol filling station will open shortly thereafter. The remaining homes will be built on a phased basis during the course of 2016-2018. The ExtraCare retirement village will complete before the end of 2019. Robert Birch of Shirley Advance said: “This is great news, after so many years of uncertainty surrounding the old Powergen site. “The consultation we undertook with local people indicated that this new development will be very welcome in Shirley.